#KidneyWk 2015: Does Personality Training Improve Communication Skills of Nephrology Fellows? During the education poster section on Saturday I came across an interesting poster led by Anna Burgner and Julia Lewis from Vanderbilt University. The title of their poster was “Improving the Communication Skills of Nephrology Fellows By Utilizing MBTI Training.” Personality type strongly influences communication. Prior studies have shown that health professional training in personality types can improve communication skills (Lawrence, Am J Pharm Educ, 2007). Burgner and colleagues wanted to apply personality type training to nephrology fellows at Vanderbilt University. To do this they first administered the Myers-Briggs Type Indicator (MBTI) to all of the nephrology fellows at their program. Next, the group had dialysis nurses assess the quality of communication between the fellow and a patient using the standardized Kalamazoo Essential Elements Communication Checklist-Adapted (KEECC-A). With this baseline data in hand each of the fellows attended a several hour didactic to discuss personality dichotomies. This session also illustrated personality type examples in small groups and lastly the fellows were placed in teams with dissimilar personality types to learn how different personality types communicate by participating in a scavenger hunt to allow for real-time spontaneous experience. The fellows next retook the MBTI knowledge exam and 8 weeks later dialysis nurses reassessed how they communicated with patients with the same KEECC-A instrument. What did they find? First, they found that over the 8-week post intervention, fellows average test score on the MBTI knowledge exam improved from pre-intervention 81% to post-intervention of 93%. Thus, indicating that the didactic was successful. However, the pre- and post-intervention dialysis nurse KEECC-A scores did not differ for the individual fellows. It was very interesting to see that that each of the fellow’s scores were virtually identical before and after the intervention. The fellows did report specific patient interactions that they felt were improved because of their knowledge of personality type. The group feels like interventions like this are valuable for improving communication skills in physicians. As they point out, their study had several limitations. The study design could be improved by standardizing the communication scenario graded by the dialysis nurses. Second, the inclusion of a control group who did not undergo the didactic could prove useful to make comparisons. It is clear that communication is dynamic process and assessing is not easy and might be difficult to capture. Even with this result, I believe this is an interesting study and applaud them for completing the study. Communication skills are fundamental to providing high quality care to patients, so it is vital we continue to pursue this topic. I could also envision testing and improving communication skills between health care workers as well. I look forward to seeing where this research goes. 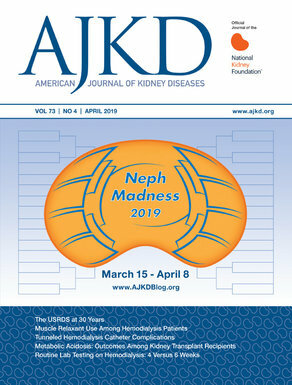 Post by Dr. Matthew Sparks, AJKD Blog Advisory Board member. Check out all of AJKD Blog’s coverage of Kidney Week 2015!